This page describes new sections of the Coyote Creek Trail, existing trails and public lands along the creek north of Coyote Hellyer County Park, and planned and potential trail segments. Since this page describes areas that are under development, conditions are likely to change frequently. The purpose of this page is to inform the public about new and possible trail routes and get them interested in the development of the trail. It is not intended to encourage unauthorized exploration of undeveloped sections along the creek. (See the disclaimer below.) If you support the trail development, let your local representatives know. 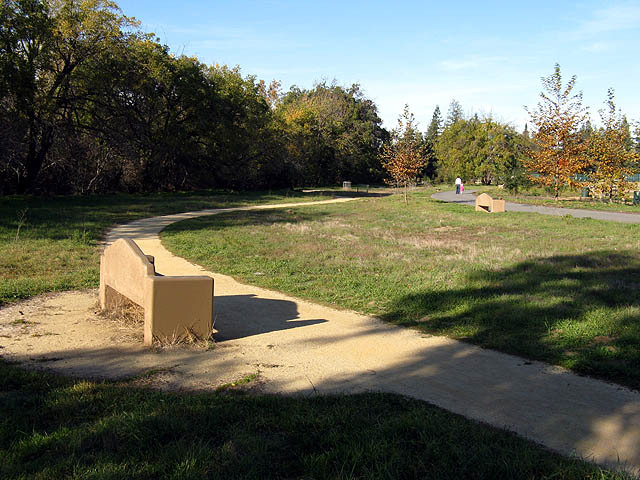 North of Capitol Expressway is a newer trail segment along the Los Lagos Golf Course, a public San Jose municipal course. This segment looks like the rural parts of the trail in the Coyote Valley. The trail leads to shady Stonegate Park, at Tuers Road and Gassman Drive. 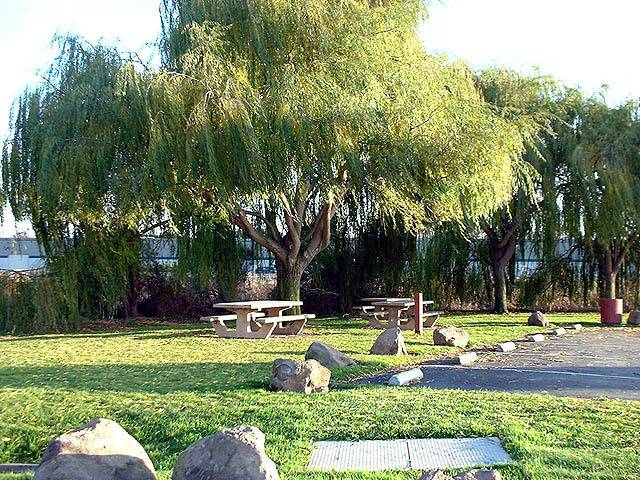 Stonegate is a popular 4-acre San Jose city park with picnic areas, playing fields, and playgrounds. There is a skate park there. Next to it is Stonegate Elementary School. 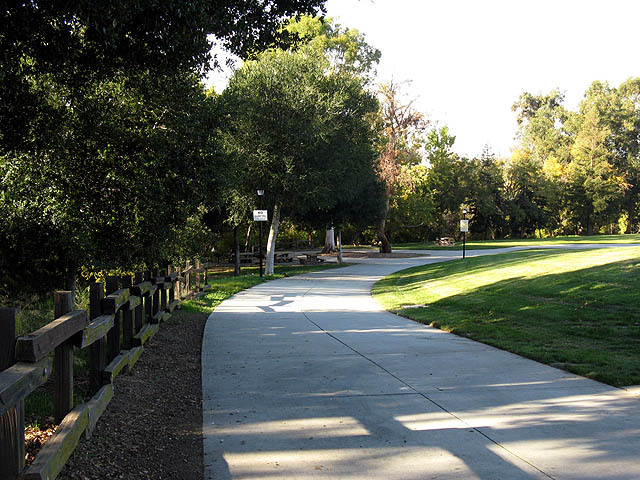 A paved path runs along the creek through the park to the corner of the San Jose Police Mounted Patrol Unit, near Tully Road. There, a path leads out to the street, while a new section of trail continues along the creek. It runs behind the San Jose Police Horse Stables and a Little League ball field. The trail currently ends on Tully Road. A path runs along Tully to the Tully Library and sports field complex. On the west side of the creek on La Ragione Avenue is the Nuestra Tierra community garden. Part of the Los Lagos Golf Course is on the west side of the creek. There are no official trails on the west side of the creek, and homeless camps may be found in the undeveloped areas. The Coyote Creek Trail runs by the Stonegate Park skateboard facility. Beyond it is the San Jose Police Horse Stables and the new section of the trail opened in August 2009. The continuous Coyote Creek Trail ends at Tully Road. 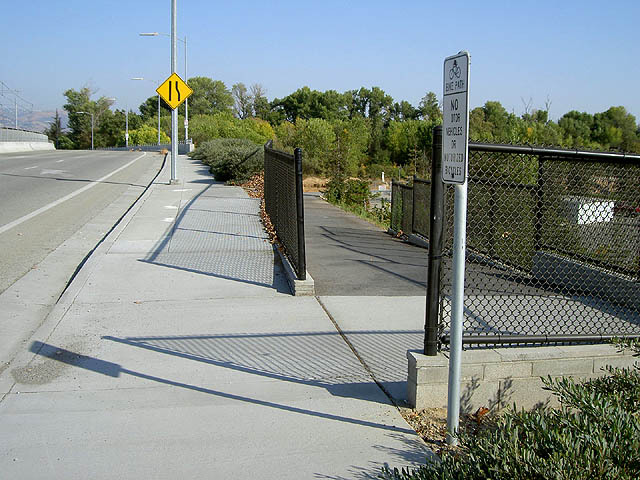 See here for San Jose's current Coyote Creek Trail Feasibility Study for future trail plans. On the west side of the creek north of Tully Road, the creek runs behind several commercial and industrial complexes. North of there, Wool Creek Drive runs behind the George Shirakawa Sr. Elementary School and the Franklin-McKinley School District headquarters. There are old orchards next to the creek. The road follows along a loop on the west side of Coyote Creek. Along the north side of this loop is an old ranch, Carroll Hay and Grain, which is on the east side of Coyote Creek, but its entrance is on the west side of the creek. Rock Springs Playground is off Senter at Rock Spring and Needles a little north of there. At the end of Phelan Avenue is the overflow parking lot for Kelley Park. Next to it is an old walnut orchard. Dirt ranch roads runs through the orchard. A paved path leads into the developed part of Kelley Park. Kelley Park is home to the History San Jose Park, the Japanese Friendship Gardens, and Happy Hollow Park and Zoo. Happy Hollow has been closed since July 2008 while it is undergoing a $52 million renovation. It will reopen in March 2010. The main entrance will face Coyote Creek. Parking for the park will be on the east side of Coyote Creek, connected to the park by a bridge. Paved trails run through the developed part of Kelley Park. There are lawns and picnic grounds along the creek. Kelley Park ends at Story Road. A narrow dirt path runs under the west side of the Story Road bridge. A makeshift unofficial creek crossing crosses to the open space on the east side. This is not a park yet. The open space area north of Story Road is the former Story Road Landfill. It is posted as no trespassing. Plans call for the Coyote Creek Trail to start by the intersection of Story Road and Remillard Court on the east side of Coyote Creek. 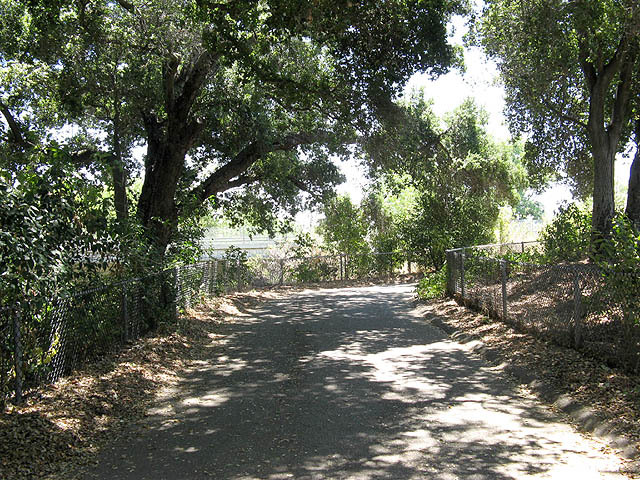 It will follow an existing maintenance road that runs under I-280 to newly-developed Selma Olinder Park. Cutting across the middle of the landfill site is the proposed route of the Willow Glen Spur rail-trail, named after the former Union Pacific rail line that once ran through Willow Glen to downtown San Jose, serving local canneries. The trail is also called the Three Creeks Trail because it joins three creek trails. When that trail is completed, it will join the Coyote Creek Trail with the Highway 87 Bikeway, the Guadalupe River Trail, and the Los Gatos Creek Trail, providing a critical mid-city link between these major trail systems. It will also provide access from these trails to the Tamien Station, which is both a VTA Light Rail and Caltrain station. 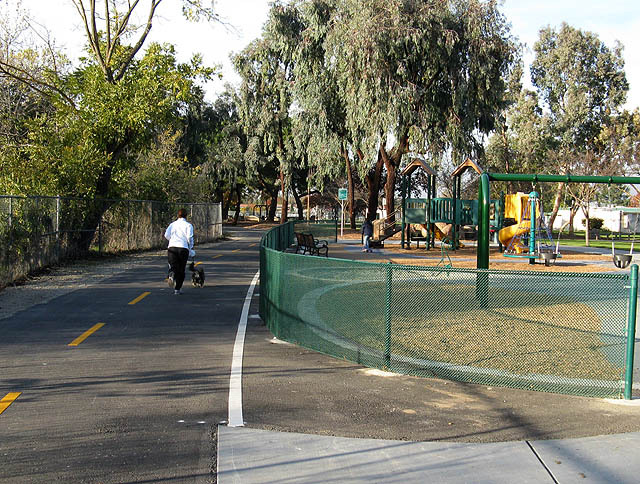 North of I-280, in Selma Olinder Park, gravel paths run along Coyote Creek and paved trails run through the park past an off-leash dog park and large playing fields to Olinder School and Community Center. North of Santa Clara Street is 10.8-acre Roosevelt Park. Park trails run along the east side of Coyote Creek. North of the park is San Jose High Academy. There is some room to walk between the creek and the high school fence. A Water District levee can be taken partway up the east bank of the creek until it hits Lower Silver Creek. The east side of Coyote Creek from Lower Silver Creek up to Hwy 101 is next to undeveloped land. Plans call for the Coyote Creek Trail to run on the east bank of the creek from Roosevelt Park, past San Jose High Academy, to Lower Silver Creek, cross over it on a bridge, and then cross Coyote Creek to Watson Park. The proposed Five Wounds Trail, which follows a former railway right-of-way, will intersect the Lower Silver Creek Trail just east of the Coyote Creek Trail. The trail between Lower Silver Creek and Montague Expressway is currently being master-planned, so there are proposals, but no firm plans yet for this section. North of 101, the west side of the creek is bordered by trailer yards whose fences run right up to the edge of the steep creek banks. The east side has a levee along the creek bank, but access is blocked by the City of San Jose's Mabury Service Yard. North of Mabury, the west side of the creek runs mostly behind an industrial area. However, on the east side of the creek, north and south of Berryessa, more people walk near the banks of the creek on weekends than along any other section of the creek. This is because the San Jose Flea Market is here. The Flea Market and its huge parking lots lie along the east side of the creek between Mabury Road and north of Berryessa Road. A gated-off levee trail runs along the creek next to the Flea Market's fence. A planned BART station for the property has prompted the owners of the Flea Market to look into developing the property. 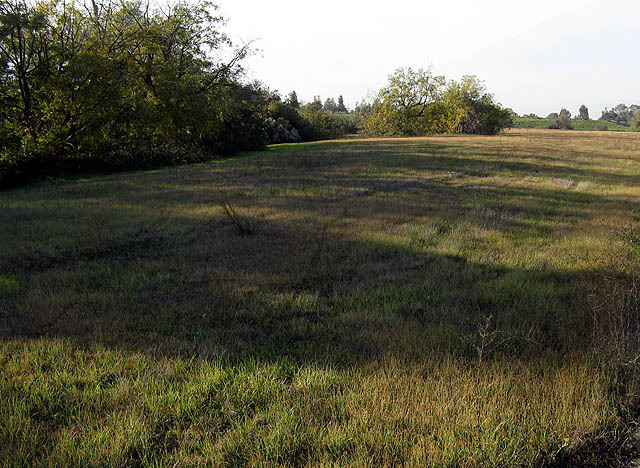 The proposed development would include trails along Coyote Creek. Upper Penitencia Creek joins Coyote Creek near Berryessa Road. Higher up Penitencia Creek is Penitencia Creek County Park and San Jose's 720-acre Alum Rock Park. Extensions to the Penitencia Creek Trail are being planned. More industrial areas lie along Coyote Creek north of Berryessa Road, blocking public access to the creek. There are large recycling facilities on the west side of the creek on both sides of Berryessa Road. The next area of public land along Coyote Creek, between Hazlett Way and Old Oakland Road is in the San Jose Municipal Golf Course on the east side of the creek. However, the creek banks are generally not accessible unless you are golfing. On the other side of the creek is North Coyote Park, an undeveloped park which runs along the creek for about half as far as the golf course. A gravel levee trail runs along the creek behind a series of mobile home parks and ends at the railroad tracks that run behind the industries along Commercial Street. The Old Oakland Road bridge over Coyote Creek is long enough to allow future trail under-crossing. North of Old Oakland Road, the west bank of Coyote Creek is paralleled by Schallenberger Road, which ends at Ridder Park Drive. The creek is visible from the shoulder of Schallenberger Road. On the other side of Schallenberger Road is the San Jose Mercury News. Ridder Park Drive crosses over Coyote Creek on a wide bridge. Ridder Park Drive crosses E. Brokaw Road. Coyote Creek flows under E. Brokaw Road, then I-880. A closed levee road runs along the east side of the creek between E. Brokaw Road and I-880. Just past I-880, the creek crosses O'Toole Avenue. Starting from here, Water District levee maintenance roads follow along either or both sides of the creek and would make good trails if they were open, which they have been at times. However, these levee roads are not yet officially open as trails. This levee road starts on the both sides of the creek at O'Toole, ends at Charcot Avenue, and begins again on the other side of Charcot. The levee roads are blocked by gates. The road north of Charcot on the west side of the creek follows along a fuel distribution facility, and is interrupted by a gate and fence at the facility. A precarious narrow footpath leads around this fence. The road continues on the other side and goes under Montague Expressway. There is no under-crossing on the east side. From Montague north are wide levee roads on both sides of the creek. The west side is officially open as part of San Jose's Coyote Creek Trail. (See here for a map.) There are trailheads on the west side of the creek on both sides of the Montague Expressway bridge. The east side gate north of Montague is not an official trailhead yet, but it has a walk-through gap. From Montague Expressway north, the west bank of the creek is in the city of San Jose. The east side is in the city of Milpitas, up to Dixon Landing Road, where it enters Fremont. On the west side of the creek north of Montague is an old farm and orchard, a large housing complex, and several industrial parks. On the east side are a series of industrial parks. There are few fences preventing access from these facilities to the levee roads. Besides the roads on top of the levees, there are gravel roads leading down to creek level. The west levees run above an overflow area for the creek that is either dry or marshy. The east side runs closest to the creek itself. Trail entrance on the southwest corner of the Montague Expressway bridge. Trail users make a U-turn to go under the bridge. The yellow sign ahead indicates that the trail ends here. Both sides of the creek lead to under-crossings under Tasman Drive. Just west of the creek is the Tasman Light Rail station. From the Tasman Drive Bridge and the end of the Cisco parking lot, the levee roads are easily accessible. There are official trail accesses on the west side of the creek on both sides of Tasman Drive. The Tasman Drive gates on the east side of the creek are locked. The levee on the west side passes by an open field, a large VTA bus lot, a small marsh, then parallels Hwy 237 and the pedestrian/bike path along it. North of 237, the official start of the Milpitas segment of the Coyote Creek Trail begins on the east side of the creek at Ranch Drive. Ranch Drive crosses over the creek on a bridge to become Alviso-Milpitas Road. At the west end of Alviso-Milpitas Road is a bike path leading to Zanker Road. Zanker Road can be taken to reach the Bay Trails at Alviso. (See here for a map of the Bay Trail in this area.) From Alviso, the Bay Trail leads to the Guadalupe River Trail, the San Tomas Aquino Creek Trail, the Calabazas Creek Trail, and the Sunnyvale Baylands. (See here for a Bay Trail Map of this area.) 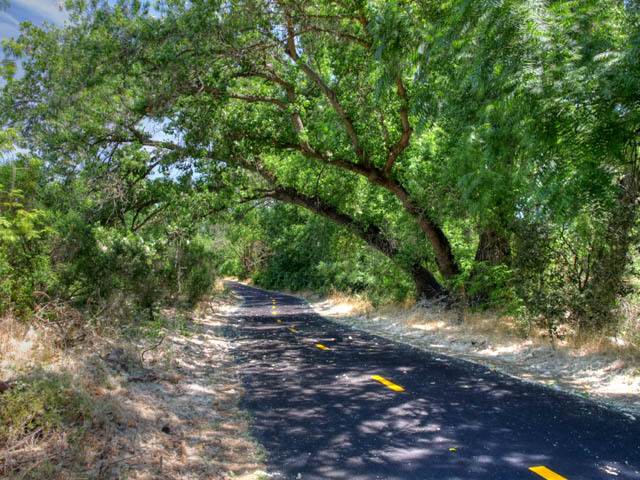 The Guadalupe River Trail will lead to the Los Gatos Creek Trail, the Alamitos Creek Trail, which will in turn link to Santa Teresa County Park and Almaden Quicksilver County Park. Along Coyote Creek north of Alviso-Milpitas Road, people with sensitive noses should be wary here. The giant San Jose/Santa Clara Water Pollution Control Plant and ponds are west of Coyote Creek. So is the Zanker Road Landfill. Wide levee roads continue on both sides of Coyote Creek. However, the west side in San Jose is currently closed due to construction. 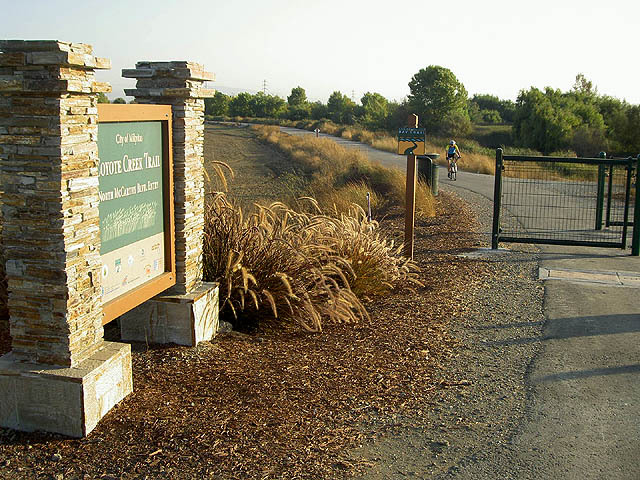 On the east side is the official trail in Milpitas, near the McCarthy Ranch development. The 2.75-mile trail on the upper levee is paved and marked. It is part of the San Francisco Bay Trail. Lower parallel trails branch off the main trail and run closer to the creek. The trail follows behind new industrial parks, an old farm, an old packing plant, farm fields, and a retired Milpitas sewage treatment plant. A dirt road drops down from the levee and runs at creek level. At first, the lower road runs next to a wide field. Farther north, it runs right next to the creek. At this point, the creek is a tidal slough. You may see the creek waters flowing upstream. The trail ends at McCarthy Ranch Road near Dixon Landing Road. A trailhead gate offers access to the road. The Bay Trail runs for a short distance on the sidewalk and ends at Dixon Landing Road. This is currently the end of the Coyote Creek Trail in Santa Clara County. Trailhead near the intersection of N. McCarthy Blvd. and Ranch Drive. Rest area and trail entrance off N. McCarthy Blvd. Coyote Creek goes under the N. McCarthy Blvd. bridge. The trail ends ahead. South of Dixon Landing Road between McCarthy Blvd. and I-880 is the confluence of Lower Penitencia Creek and Coyote Creek. 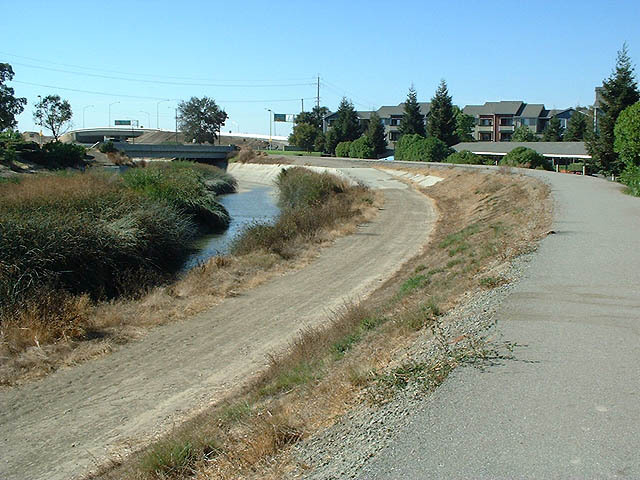 East of I-880, trails run on portions of the levee on Lower Penitencia Creek. The paved Lower Penitencia Creek Trail approaches the California Circle bridge, where it ends. In the background is the Dixon Landing Road overpass over I-880. A short distance downstream, Lower Penitencia flows into Coyote Creek. North of Dixon Landing Road, Coyote Creek forms the border between Alameda and Santa Clara Counties. On the west side of the creek is the Newby Island Landfill in Milpitas. On the east side of the creek, the Creekside Landing Shopping Center has been under construction in Fremont. Though the project is currently on-hold, plans call for a Bay Trail easement through the site. Beyond that, next to a Fremont industrial park, is the Bay Trail along the Coyote Creek Lagoon. Waters from Coyote Creek flow through this lagoon. The trailhead is at the end of Fremont Blvd. south of Lakeview Blvd. The wide gravel trail runs parallel to Fremont Blvd. next to the lagoon, and ends at Landing Road. Dirt trails explore further west into the lagoon and marsh area. Though not labeled as such, this little park and staging area at the end of Landing Road is effectively the northernmost trailhead for the Coyote Creek Trail. Just before the Coyote Creek Lagoon, the main section of the creek turns west and flows past Mallard Slough and can be seen from the Mallard Slough Loop Trail. The portion of the creek that flows into the Coyote Creek Lagoon flows into Mud Slough, which rejoins Coyote Creek after Station Island. Coyote Creek joins with the Alviso Slough. They can be seen from the Alviso Slough Loop portion of the Bay Trail. Shortly after it joins the Alviso Slough, Coyote Creek enters San Francisco Bay, north of the Sunnyvale Baylands, near the mouth of the Guadalupe Slough. The Alviso Slough is fed by the Guadalupe River. The Guadalupe River Trail runs upstream from Alviso all the way to downtown San Jose. MetroActive: "Back on the Trail - Coyote Creek scares many outdoor enthusiasts, but improvements are supposedly on the way"
The information on this page is the result of personal observation, speculation, and information gleaned from the Internet, including satellite photos. This page has not been reviewed or approved by any park or government officials. It reflects conditions that may change at any time without notice. The user is responsible for insuring the legality and safety of accessing the areas described above. Sections of creeks that have little public use are often used as dumping grounds, transient camps, and sites for illegal activity. Coyote Creek is no exception. Use due caution in approaching undeveloped areas of the creek.